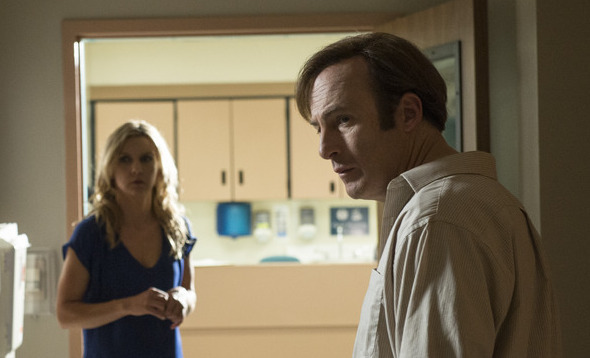 There’s a point in “Alpine Shepherd Boy” where Jimmy McGill goes to see a new client after his billboard hero story and I wondered whether or not Better Call Saul was about to head down into a procedural route blended with the serialized storytelling. The premise of a lawyer with his sharp wit and wacky clientele could easily fuel a more episodic series; a form of television that is exceedingly becoming endangered as long-form stories become more and more popular. I’ve admittedly turned a blind eye to more episodic fare on occasion because for some reason it is fashionable to look down upon them these days, but in the right hands (and this show is surely in the right hands) the material for a case-of-the-week Jimmy/Saul show could be wildly entertaining. Alas, it doesn’t look like my pointlessly overlong side note will come to fruition if “Alpine Shepherd Boy” is an indication of the direction this show is headed into. It does, however, spend the bulk of its running time with Jimmy meeting his oddball set of new prospects, tipping the tonal scale from light drama over into eccentric farce. Each of these vignettes, from the tycoon who wants to secede from the U.S. to the inventor whose child toilet trainer inadvertently turns sexual, are funny in their own right. Tycoon Richard Sipes is quite the impressionable character and one who I wouldn’t mind seeing pop up time and time again as a minor recurring character, though I doubt that will happen. I bring up the notion of episodic stories because they can be a reprieve from the bigger arcs that can’t always sustain the episode orders made for TV seasons, and “Alpine Shepherd Boy” feels like it’s dallying with the idea of going down that path without fully committing. The interludes with the clients are little more than humorous space fillers until Kim and Jimmy get the call about Chuck in the hospital, only to go back to Jimmy seeing his clients, and then jump back to him dealing with Chuck. The episode doesn’t balance its structure and tone between the two approaches as smoothly as it could have. I’ve also found that I’m not as fully invested in the relationship between Jimmy and Kim as the show would like me to be, although this week allows the two of them to share more personal interactions outside of work and see their softer sides together. The matter of Chuck’s “condition” is given much more attention though, with Clea DuVall’s doctor confirming our suspicions that his “condition” is more mental than physical, something that I saw as the case from the start but is nevertheless given a rather longwinded explanation. I got the sense that “Alpine” was making a conscious comparison between Jimmy providing for his brother and the ways that we take care of the elderly once they hit a certain point in life. 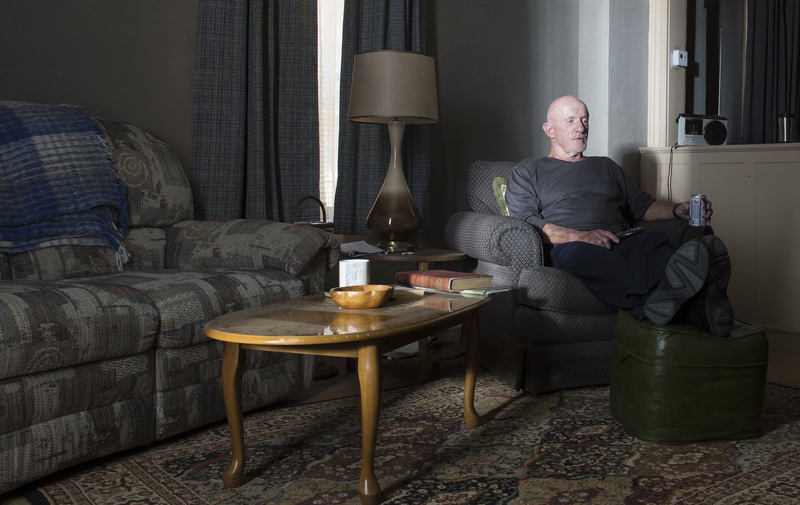 Chuck’s existence at home isn’t so different from that of a lonely elderly person sheltered from the outside world, and the older décor of his house along with its spare spaces suggest the loneliness he feels. On another (much shorter) side note, Jimmy watches the older TV show Matlock to get a feel for how he should present himself to the older crowd, and I couldn’t help but see the coincidental similarity between the logo for that show and the one for Breaking Bad with its periodic table design. 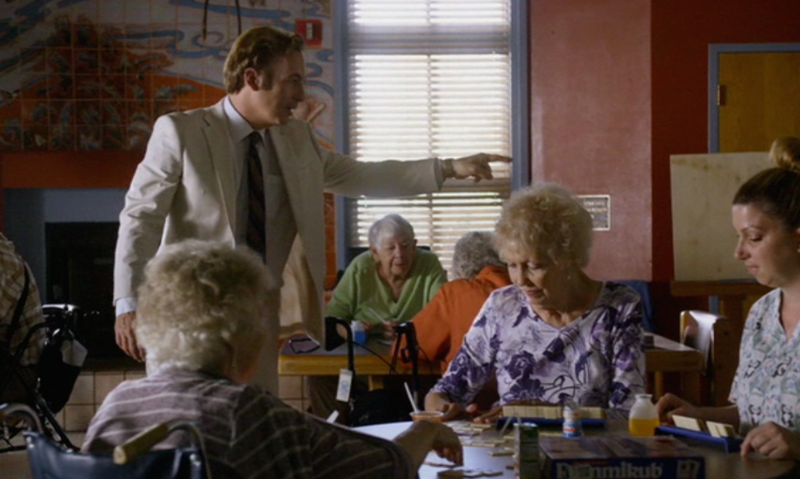 Speaking of the lonely and the elderly, the final minutes of the episode take an unexpected left turn into the life of parking attendant Mike, who is even more isolated than Chuck is. He sits alone at the diner and can’t even get close to talk to the mystery woman who acknowledges his presence with familiarity (I assume this is his daughter since Breaking Bad made a point of Mike’s affection for his granddaughter). Before the episode ends with (presumably) Mike’s old police partner and several officers approaching Mike at home, his house and living is defined by cold stillness, a quality that actor Jonathon Banks has used to define the character himself since being introduced many years ago. Chuck and Mike both have tentative threads holding them to the lives of others, but with Mike’s partner returning and Slippin’ Jimmy threatening to undo Chuck’s trust, it looks like the past is coming back to haunt them both.